I made these one lazy afternoon when I had hotdogs but no buns – and no inclination to go to the store. However, I serendipitously had all the fixings for pretzels. As you might have noticed – I have a love affair with hot dogs. I avoided them for years, but was thrilled when Applegate and other brands started making sustainable varieties without fillers. There’s really nothing like the snap of hotdog to take you back to the barbecues of your childhood, and these ones are extra special: a barbecue meets amusement park, but without white flour, sugar or any of the nasty stuff. Since these require a bit of work (and time! ), you may want to make an extra batch to freeze. Complete steps 1 through 7, then drop the hot dogs in boiling water. Let the hot dogs cool, then place in the freezer on the cookie sheet for one hour before freezing completely in a ziploc bag. When you’re ready to use them, brush the frozen pretzels with egg wash and sprinkle with salt. Bake at 350 degrees for about 15 minutes or until warmed through and golden brown. Serve with copious amounts of mustard and coleslaw. 1. In a small bowl, whisk together the warm water and the honey, then add in the yeast and stir. Let sit for 10 minutes or so, until yeast is foaming, then add the olive oil to the mixture. 2. In a large bowl, combine 2 cups of flour and the sea salt, then add the yeast mixture. Stir until the ingredients are well combined, adding flour as needed, until the dough is easy to handle (I used about 2 1/4 cups total). Next, knead the dough for about 3 minutes, before forming it into a ball. 5. Place the dough in a bowl lightly coated with oil and cover with plastic wrap and a damp cloth. Let rise for one hour – the dough should double in size. 6. While the dough is rising, preheat the oven to 450 degrees and grease a cookie sheet. In a large pot, bring 2 quarts of water and the baking soda to boil. 7. When the dough has risen, separate the into eighths and stretch each piece into a rope – about a foot long. 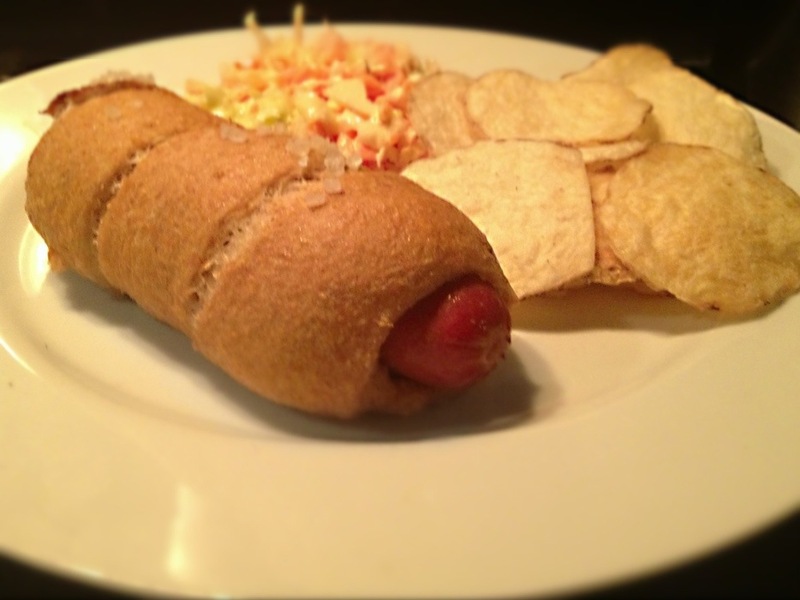 Coil one piece of dough around each hot dog, leaving the end of the dog peeking out. Pinch the ends of the dough together to secure. 8. Drop the pretzels – one at a time -into the boiling water for 30 seconds, then use a slotted spoon to place them on the cookie sheet. Brush the top of each pretzel with the egg wash and sprinkle with the coarse salt. 9. Bake the pretzels until dark golden brown – about 12 to 14 minutes. Let cool for at least 5 minutes before serving.